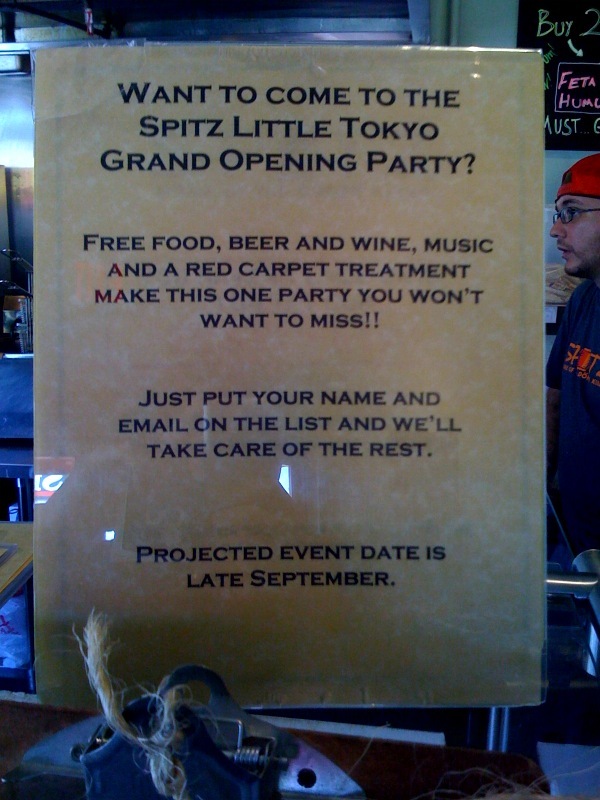 Spitz, everyone’s favorite local Döner kebab shop, is opening up a second location in Little Tokyo, and they’re throwing a party to celebrate. Unfortunately, they have yet to specify when that party is, only getting as specific as “Late September”, but free food, drink, and music are promised, as is a “red carpet treatment”. To get more info, put your name and email down on the list sitting next to the register at Spitz the next time you’re in there. Spitz is a local restaurant, specializing in kebabs and falaffels, located on Colorado just before Target. It was founded by two Oxy grads (class of 2005). And, of course, Oxy students get a discount– show them your Oxy ID and you get 10% off (which is nice, but still more expensive than eating at the Marketplace). This entry was posted on September 1, 2008 at 11:32 pm and is filed under Uncategorized. You can follow any responses to this entry through the RSS 2.0 feed. You can leave a response, or trackback from your own site.